Virgen de Guadalupe, 35610 Caleta de Fustes-Fuerteventura, Spanje. Magnificent apartments in Fuerteventura. The Complejo Castillo Beach is nowadays one of the most symbolic accommodations of Fuerteventura. This apart-hotel is located on the famous region of Caleta Coast, close to the Caleta de Fuste beach, to the sport leisure port and to the only one golf course from Fuerteventura. The apartments, designed by the artist Sergio Calvo, preserve the typical style from the Canary Islands and the comfort of its modern facilities. The Complejo Castillo Beach has 2 types of apartments, ideal to enjoy an unforgettable time with the family, as well as in couple. The first type includes simple apartments on the ground floor with double Bedroom, lounges, cuisine and Bathroom. 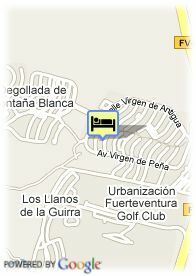 The second ones dispose of double Bathroom, totally equipped cuisine, TV lounge and Bathroom. 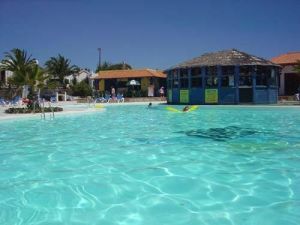 The Complejo Castillo Beach has restaurant, bar, supermarket and a great variety of facilities to practice tennis, basketball or five-a-side football, with swimming pool, too.